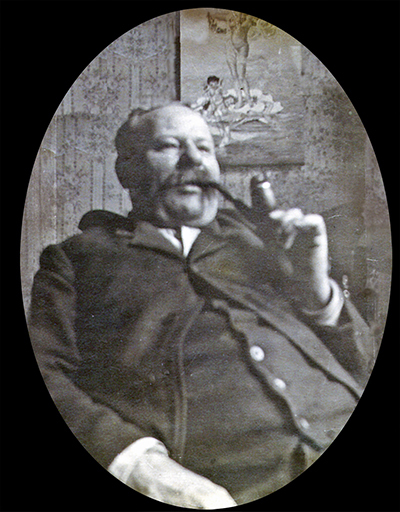 My Great Grandfatther, Charles Hechler (June 15, 1855 - June 19, 1912), a native of Darmsdat Germany, came to the US in 1871 at the age of 16, according to his obituary in the Amittyville Record of 1912. He lived in Amatyville, LI. Here is his death certificate. "Charles Hechler Worked as a butcher and rented a place on Fourth Street in Manhattan. He attended public school to learn English and became an American citizen in 1881. Working from 6 am to 10 pm daily to save enough money to buy a butcher shop located at 125th street and Lenox Avenue, Bronx, NY. He used to awake at 4am to buy meat and was successful enough to acquire three more shops. One was at 745 Columbus Ave, 1695 First Ave and the other has been forgotten. He married at 27 to a woman whose parents owned a wine store. Had ten children and brought over a number of relatives to work in the butcher shops. He purchased a very large farm in Amityville, NY and two apartment buildings: one between 1st and 2nd Ave on 70th St and the other was 1695 1st Avenue, New York, NY. He passed away in 1912 of a heart attack. "By Kurt Weiss. My grandparents, Theodore Hechler, Sr. and Hannah May Hechler, moved from upper Manhattan to Fordham Hill in the Bronx. 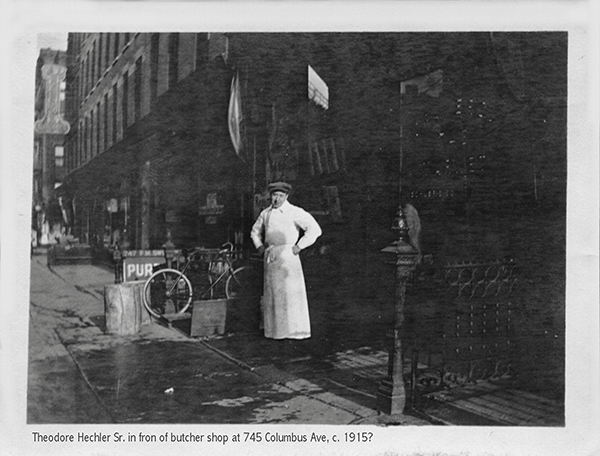 My grandfather ran a butcher shop at 1695 First Avenue, New York, NY (leased in 1897). I remember eating marvelous steak tartar that Grandma ground fresh in the kitchen on Sundays. They had an ice box and the iceman delivered ice. I remember going for long walks in the park with my Grandpa. I sometimes used to hear the sound of our feet on the gravel paths as I fell asleep at night. My father, Theodore “Ted” Hechler, Jr. was born in New York City, September 26, 1916, died August 14, 1983, he was living in Annapolis, MD at the time. He is buried at the Arlington National Cemetery. 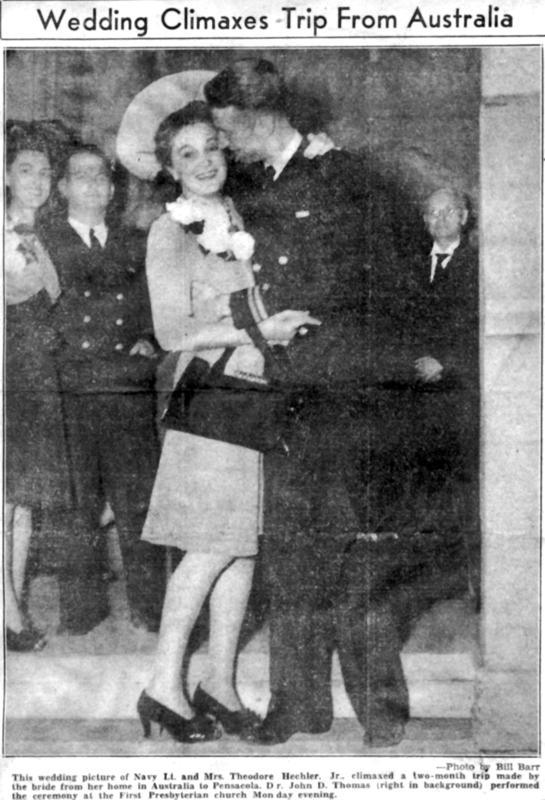 Ted Hechler went to Annapolis Naval Academy and graduated in 1940. Ensign Theodore Hechlerr, Jr. was aboard aboard the Phoenix on that fateful day in December 7, 1941, when Pearl Harbor wa bombed. His personal account is a riveting. Ted Hechler met my mother, Noel Estelle James, when the Phoenix sailed to Perth, Western Australia, in 1942. After many difficulties, mostly because of wartime security, she managed to book a passage aboard the Kookaburra to the United States, where they married. My mother was the first war bride January 1, 1943 (according to Reuter’s news agency). Ted got his wings at the USN airbase at Pensacola, Florida 19 June 4, 1943, and became a pilot with the VPB-92 squadron (he mostly flew PBYs). That unit was discontinued in 1944. Aeronautics was his main interest. I remember bing in his room at my grandparents’ apartment when I was four. Model planes hung from the ceiling which I looked at with longing. Ted went to Boston (c. 1946) and received a degree in aeronautics. That degree was put to good use. He left active service in 1946, retired from the navy in June 1960, went to work for G.E until 1964; lastly, he worked for NASA's Apollo space program as a programmer until retiring in 1974. I am continuing to piece together a history of his life. My mother and father divorced in 1955 and she moved to England in 1956. It is unfortunate that I never got to spend much time with him; consequently, my knowledge of his past is very scant. I thank all those who have helped me gather more information. As I find out more, I will add some of it to this site.